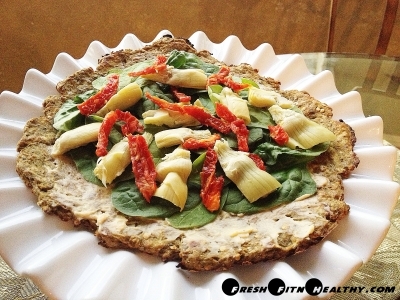 A healthy spin on your typical pizza crust using a unique vegetable! Better than cauliflower crusts! Preheat oven to 400 degrees. Remove outside skin of eggplant (can use potato peeler), and shred it. Place it in a towel and squeeze to take as much liquid as you can out of it. Allow it to sit in towel for 10 minutes at least. Then place the shredded eggplant in a bowl and add other crust ingredients (flaxseed, flour, egg, guar gum, basil, sea salt) . Mix to combine all ingredients. Place a piece of wax paper on a cookie sheet, and spray it lightly with cooking spray. Place â€œdoughâ€ onto wax paper and spread out to thinness you desire in a circular shape. Place sheet in oven for 20 minutes. Remove. Take another piece of wax paper, and flip crust over on to that one. Put back on cookie tray and cook again for another 10 minutes. Check to see if done. If crust is as desired, take out. If desiring a more crunchy crust, cook for 5 minute intervals until done. Take tomato basil cheese out of wrapper, and spread onto crust. Cook spinach for a minute or two, just enough to slightly wilt it. Place artichokes and sundered tomatoes on top. Sprinkle with sea salt or season salt and enjoy!